Helping you find the perfect solution at an affordable price. Why Choose B2B Interiors for your Office Furniture? Electrically heigh adjustable desks via the memory master control unit. Comfy chairs, tables, sofas, lighting and accessories. We are one of the leading suppliers of office desks in Ireland and in this section you will find all sorts of different styles of office furniture to meet your needs. Our reception furniture, office reception desks and reception seating not only offer the most exciting designs but lasting high quality at fantastic value. Our reception furniture range also includes accessories such as coat stands, floor mats and mailboxes. We have the most comprehensive selection of office chairs and desk chairs available online and in the UK. This includes the most up to date ranges of the best office seating available. Whether you are looking to separate workstations or to create interesting configurations that add an aesthetic appeal to your environment, we have one of the largest collections of office screens and dividers online and have solutions to suit every office. Our executive and conference room office furniture is designed to make a statement about who you are as a company, and to reflect your values and corporate identity. Break out seating refers to the seating that is situated in a rest room, staff room or any break out area. Using soft seating, chairs and furniture, these areas can be turned into a workable area. Choose from our different seating models which are all available in high quality wool fabrics or leathers. From formal conference & boardroom furniture, to a comfortable meeting space, facilitating you every step of the way. +353 (01) 461 300 Contact Us Now! Canteens provide a space for employees to have their daily meals and interact with each other. It is important for your employees so that they can be refreshed to continue their working day. 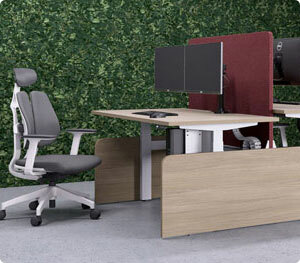 Our range of ergonomic sit stand desks, chairs and accessories have been designed to provide maximum comfort and promote good posture to the user whilst working. B2B offer a comprehensive range of training room furniture, supplying a wide range of finishes and styles to suit every budget. Our modular table systems are flexible and easily reconfigurable. Office acoustic treatments greatly improve productivity within the workplace. A good acoustic environment in the classroom promotes good learning and healthy surroundings. The office storage section will provide you with a wide range of office storages solutions to suit your needs that are finished in a wide range of colours and finishes. Our turn-key solutions optimise your investment by ensuring your property attains its maximum investment potential whilst also creating a stylish and comfortable living environment. 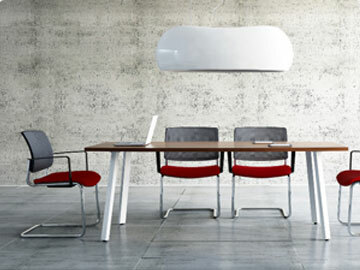 B2B Office Interiors are purveyors of office furniture. We are based in Cookstown, Dublin 24 and service Dublin and sounding counties. Other than selling office furniture, we consult, design and provide full kit-out of your offices including office desks, office chairs, conference tables, sit standing desks, reception desks and what is required to make an office building complete. From full design, to any required electrical / plumbing and building work. We provide a full start-to-finish project management & installation service for all office furnishings. We provide office furniture to one-man-band operations and large corporate offices located in Dublin and surrounding counties. Since 2000, hundreds of businesses, small and large, have continued to rely on B2B’s reliable, high quality office furniture and unbeatable service. Contact us for a no-obligation quote. We hope to hear from you soon.